Manufacturer of decorative, architectural LED area lighting solutions. 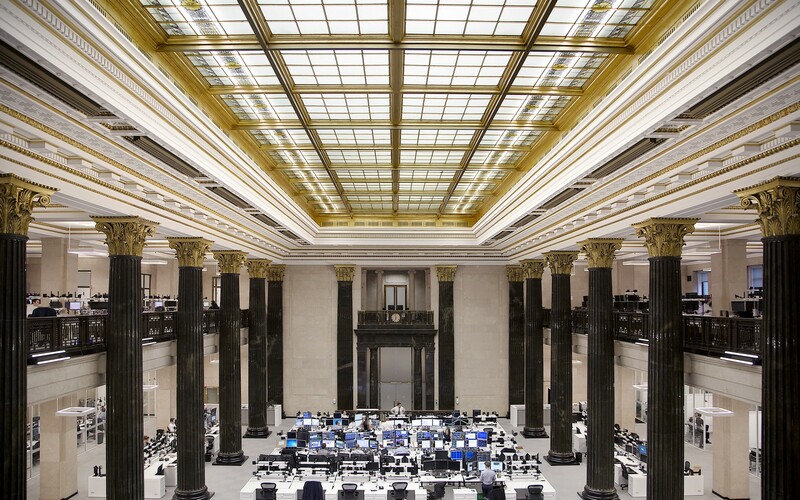 The National Bank of Canada’s Montreal headquarters possesses a Grand Hall that is an ornate masterpiece. The lighting design needed to accentuate and celebrate this historic structure’s arresting grandeur without washing out the ornate details. The main element of the Grand Hall is the impressive glass ceiling. 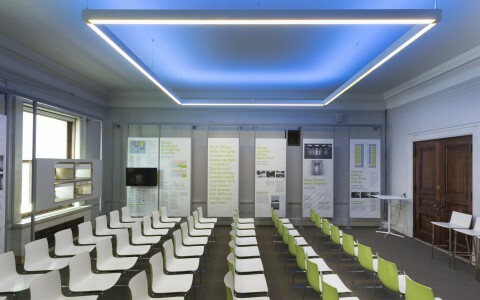 Lumenline luminaires, hidden in the glass around the artificial skylight, light the ceiling and provided general lighting for the entire hall. 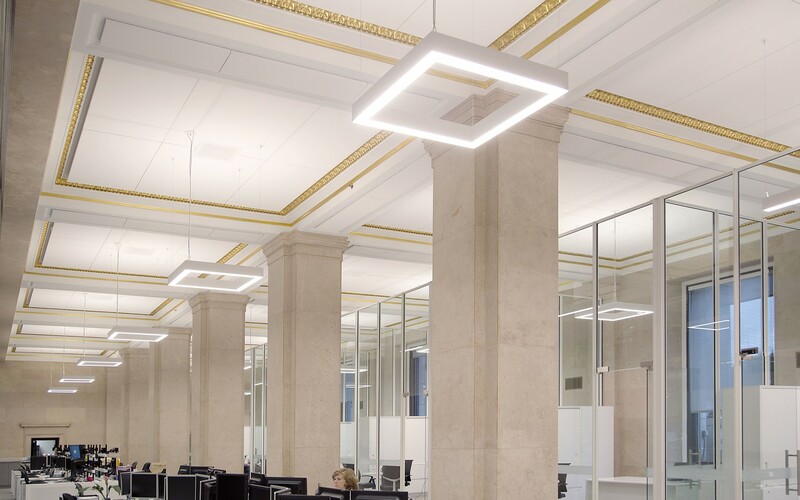 Lumenlines in square configurations with lit corners provide 3500k direct lighting and a softer 3000k indirect light to accentuate the gold leaf of each ceiling molding. 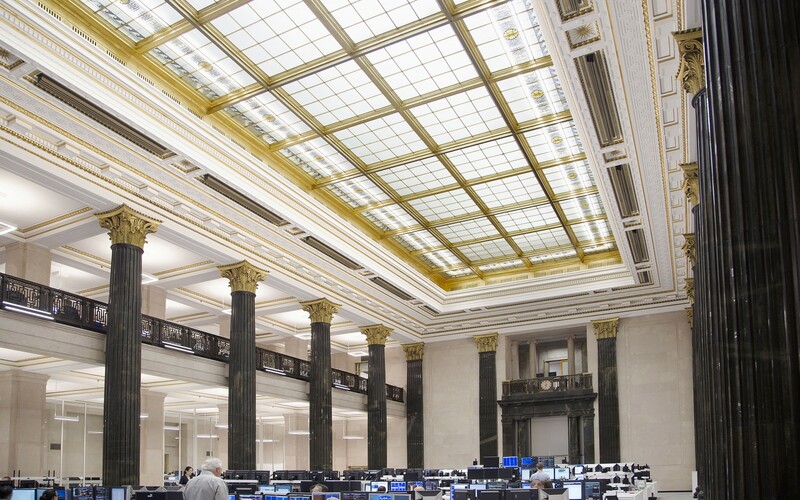 The interior architecture of The National Bank of Canada's Grand Hall, in Montréal, gets a new, brilliant life thanks Lumenfacade and Lumenline luminaires. 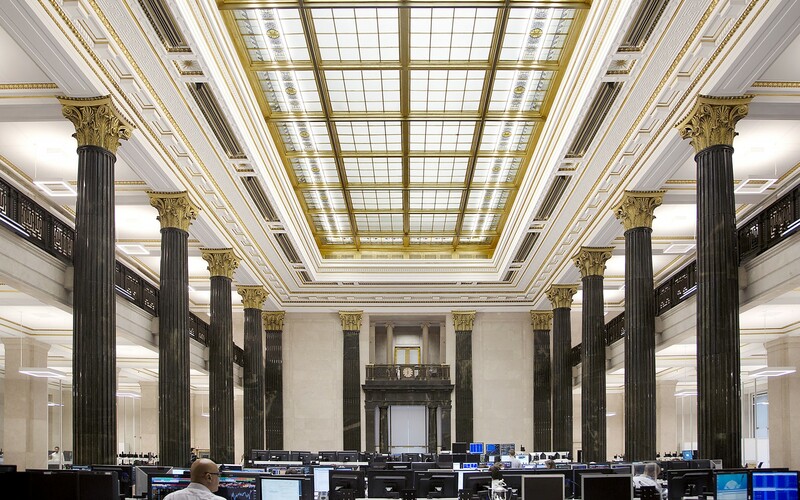 The interior of the bank was already gorgeous, but the Lumenfacades and Lumenlines make it absolutely brilliant. 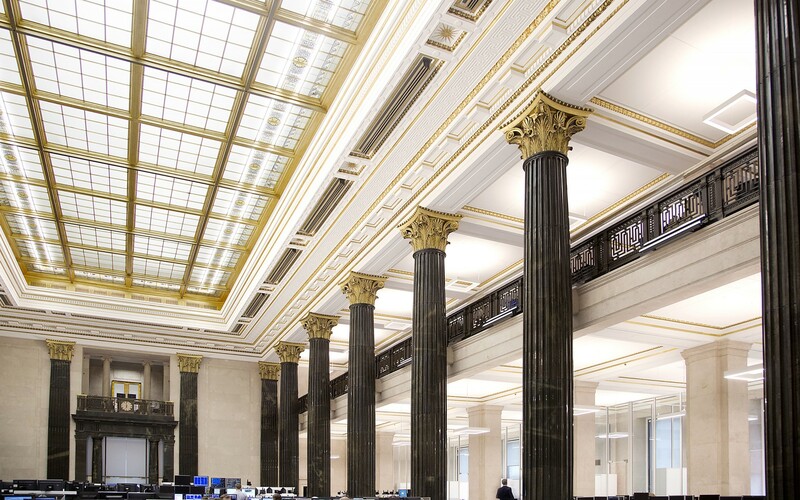 The National Bank of Canada's Montreal headquarters possesses a Grand Hall that is an ornate masterpiece. Its rose, Italian Tavernelle marble walls, Corinthian colonnades of syenite, with black Belgian marble bases, its bronze railings and door frames, golden ornamented molding, ceiling panels, and large colonnades are a majestic throwback to a bygone era. 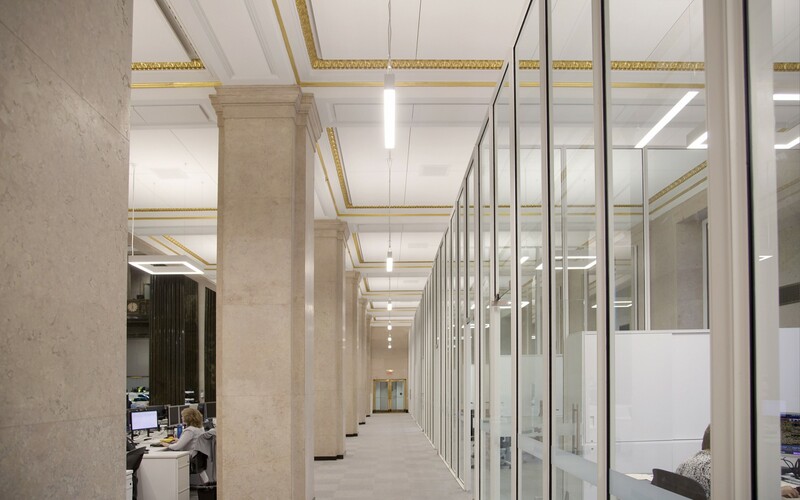 The lighting design needed to accentuate and celebrate this historic structure's arresting grandeur without washing out the ornate details, while also creating a functional and welcoming workplace. 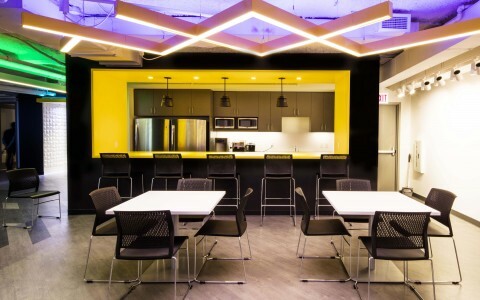 "The space was so gloomy the National Bank was not even sure it could be transformed into a modern workspace. Most people wanted to move out," said Principal Senior Architect at Architecture 49, Alexandre Sauve. 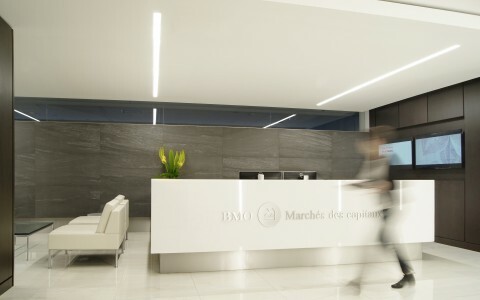 Architect firm Architecture 49, engineers Bouthillette Parizeau and lighting designers Éclairage Public worked together to modernize the space and to honor the magnitude of the hall and its architectural ornamentations. Their strategy allowed for the necessary illumination, while maintaining a clear vision and perception of the architectural lines and the powerful expression of the Grand Hall's vastness. The lighting design, which evokes natural exterior light, uses the contrasts between lit areas and less-lit areas and heightens the depth of the architectural adornments throughout the hall. The main element of the Grand Hall is the impressive glass ceiling. Lumenline luminaires, hidden in the glass around the artificial skylight, light the ceiling and provided general lighting for the entire hall. 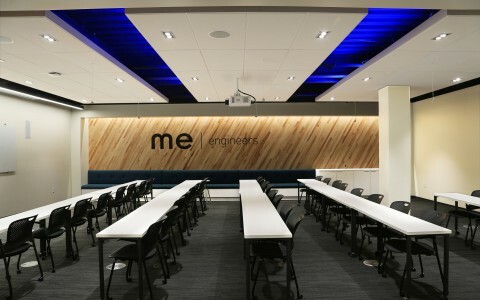 In the main employee work area, Lumenlines in square configurations with lit corners provide 3500k direct lighting and a softer 3000k indirect light to accentuate the gold leaf of each ceiling molding. The more private, glass offices are lit by 3-foot sections of Lumenlines of the same length as those found in the main employee area. Along the mezzanine, on each side of the hall, , black Lumenfacades blend with the black base of the balustrade, and enhance the gilding of the wainscoting while softening the contrasting light that comes in from the atrium windows. "This creates a great uniformity across the ceiling while still projecting a rich ambiance throughout the space," explains Gilles Arpin, Principle Lighting Designer at Éclairage Public. 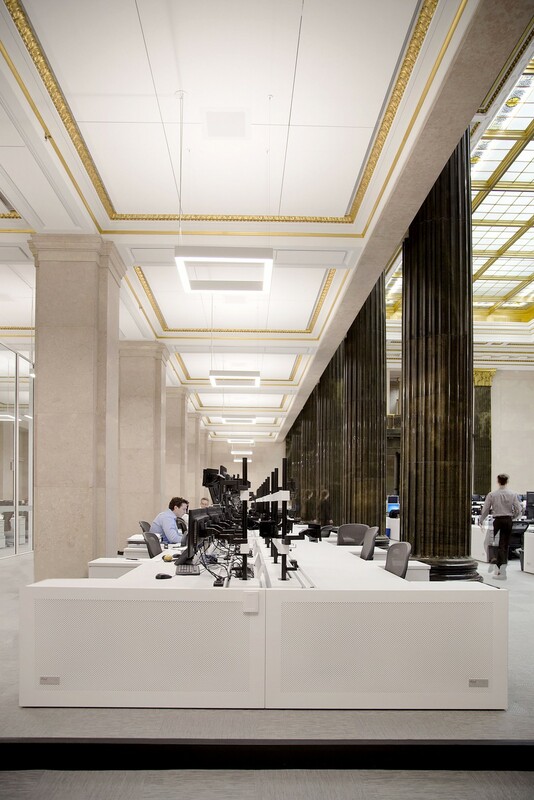 The Lumenpulse luminaires helped Éclairage Public create an unobtrusively lit environment that highlights the majesty of the architecture and supplies a comfortable workspace. 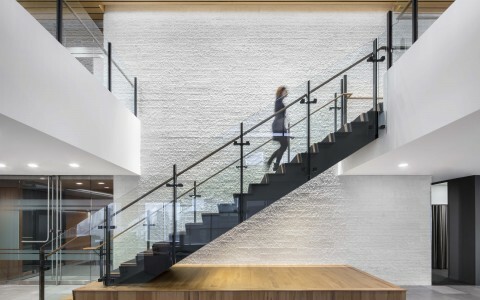 "We think we succeeded with an elegant and discreet installation," adds Arpin, "The interior of the bank was already gorgeous, but the Lumenfacades and Lumenlines have made it absolutely brilliant. "